Founded on Thanksgiving Day in 1835 to help new arrivals to the Indianapolis area with material needs such as food, clothing and shelter, Families First has evolved and changed with the community to best meet the needs of central Indiana families. Today, as central Indiana’s oldest non-profit human services organization, Families First remains dedicated to preserving and strengthening families through professional, affordable counseling and services. Families First engaged with Mojo to create a new website and content marketing engagement. 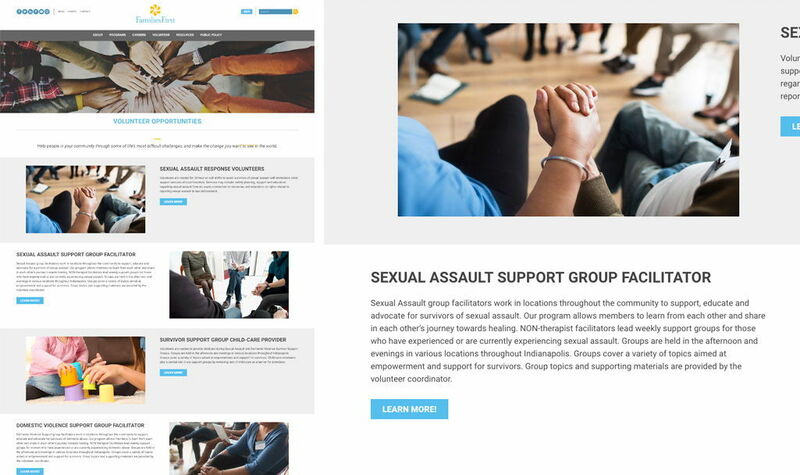 The challenge was to build a best-in-class website for the organization and kick-start their content marketing program, with the main goals of increasing online donations, employment applications, and volunteer applications. We built the website to highlight these important priorities through homepage CTAs and a prominent Donation button on every page. The site allows administrators the flexibility to change featured content as priorities evolve. Through engaging, educational content and campaigns, we launched Families First resource area of their website with a Blog, and we reached out to local bloggers and community websites to spread the message and build organic traffic and referral links. The homepage offers a featured area that the users can easily update themselves, or with help from SpinWeb team, to feature new programs like seasonal events. The marketing program focused on creating educational content that would appeal to Families First’s audience. The success of the blogging program is evident in two blog posts appearing as #2 and #3 of their most visited pages, right after the homepage. This helped double their organic traffic in just a few short months time. 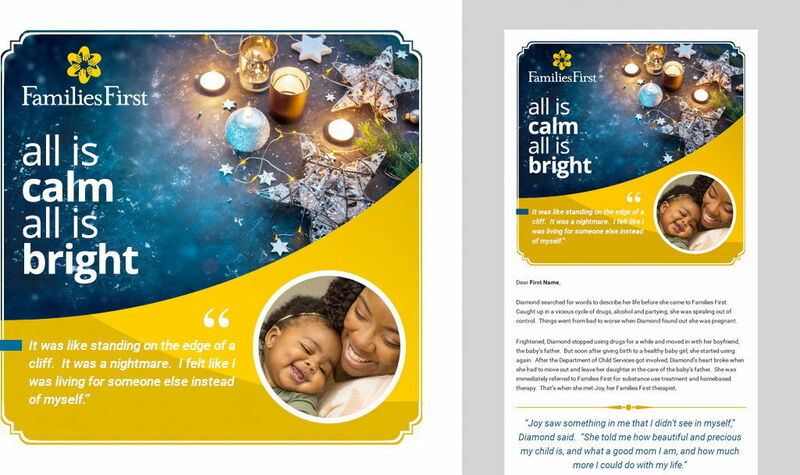 SpinWeb helped Families First move their holiday appeal to a multi-channel approach, which included email marketing alongside the direct mail piece. One of the goals of the website was to make it simple to volunteer. We built a volunteers module that lets admins easily update volunteer descriptions and opportunities, and it includes online forms in-line with the opportunity descriptions, which reduces friction in the sign-up process and increase form submissions. 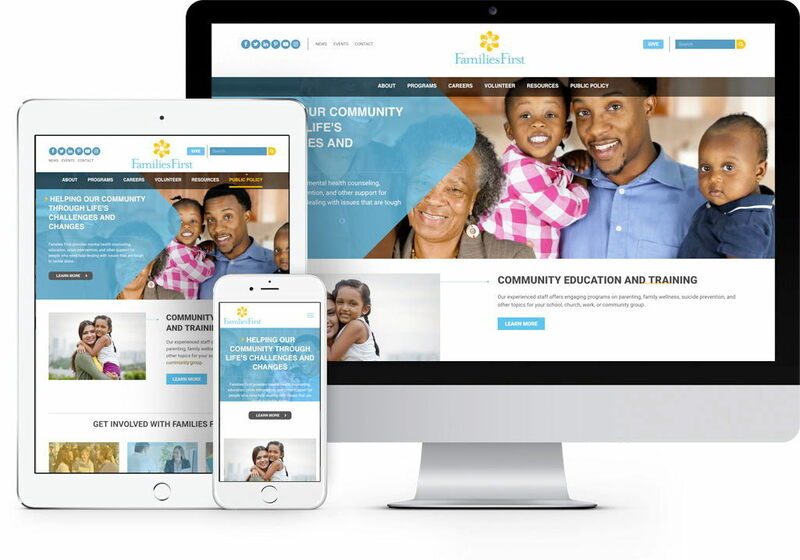 With a gorgeous website that’s simple to maintain and a marketing strategy in place, Families First now has a modern online presence to support their mission. See the website for yourself.